Hastings, an English coastal city has an average population of 86,900, is called this way because it is the clan of barbarian Haestingas which invaded the city. This city known a several wars and has a very rich story. Indeed, in 1066 there was the Hastings' war leads by William the Conqueror against Harold Godwinson, thanks to that William became the king of England. Then, Napoleon III took refuge after the announcement of the Republic. Regarding the different wars and changes known by Hastings the it is really interesting place to visit. Within its famous castle ruin, its beach and its fishing port, hastings is definitively a lovely british city. If you want to dance all night long and to be in the place to be, go to the Venuu Bar, take a coktail in the VIP lounge, relax yourself waiting for night party until morning in the night club. For something more calm, venture to the town center and opt for the typical english pub to enjoy your trip and your night. Do want to do shopping at Hastings ? 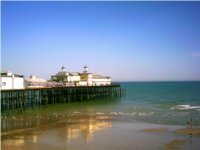 Go to the town center and discover to Priory Meadow (Hastings shopping center), you will find a lot of shops like Clarks, Claire's, Bonmarche, River Island... There are a lot of shops in Hastings, even the most demanding person could be satisfied. The major attractions are the fishing port and the castle. Moreover there are a lot of historical sightseeing possible. The old town center and others beauty spots are also lovely places. Hastings is in the South of England, it is the coastal weather and the rain is frequent. The winter is very cold and the summer is always temperated. Hastings has several means of transport like the bus to go to Kent, Taxi to get around the city, Ferries to go to France and train station to travel accross England.